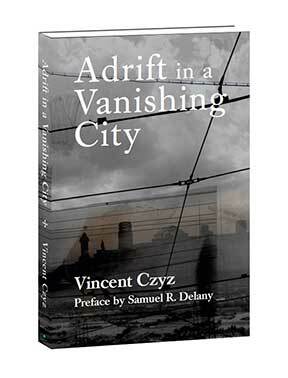 Vincent Czyz, author of Adrift in a Vanishing City (Rain Mountain Press, 2015), will read from the book (many reviewers call it a novel, he thinks of it as a fiction collection) at Bindlestiff Books Sunday, Oct. 11, at 4 p.m. Its preface is by internationally renowned science fiction writer Samuel R. Delany, who taught at Temple University for many years before recently retiring. Adrift in a Vanishing City is a collection of short fiction in which the characters from one story often cross texts and appear another. Adrift navigates a landscape of obsessive love, dead-end streets marked by the invisible graffiti of the lives lost in them, and distant cities—Budapest, Berlin, Amsterdam, Paris. Space and time become so malleable echoes of the obliteration of Sodom and Gomorrah whisper beneath the summer moon as it arcs over the fields in Kansas, bringing the reader to the understanding that everything is a part of the moment on which we stand overlooking our lives—a moment called now. Vincent Czyz is the recipient of the 1994 W. Faulkner-W. Wisdom Prize for Short Fiction. The 2011 Truman Capote Fellow at Rutgers University, he has placed stories in Shenandoah, AGNI, The Massachusetts Review, Georgetown Review, Quiddity, Tampa Review, Tin House, Louisiana Literature, and Skidrow Penthouse, among other publications. Bindlestiff Books will be closed Friday, Sept. 25, for a major building repair. We will be open regular hours (Noon to 7) on Saturday, and Noon to 5 on Sunday. We may open as late as 3:30 Thursday, our normal staffer was called out of town for work that day. Dr. Seuss, What Pet Should I Get? In conjunction with the Dollar Stroll Thursday, Sept. 17, Phobos (Philadelphia’s weird fiction magazine — about to celebrate the release of its third issue) will present a reading by several local authors. Some spooky stuff, but the reading is open to anyone who wants to read a short piece, regardless of genre. There will be refreshments. The reading will start until 5:30, and run through the Dollar Stroll.